According to Forrester Research, US online retailers look to Canada first when expanding internationally, with 22 of the top 50 online retailers having dedicated Canadian e-stores. This comes as no surprise, as its proximity makes it easy to ship from US fulfillment centers at a reasonable cost, and there are fewer language and cultural differences. For retailers who already have a strong customer base in Canada, expansion into a dedicated .ca domain, or even “landed” operations complete with Canadian warehousing may be reasonable. But is the Canadian ecommerce market really that attractive? Internet penetration is almost neck-and-neck between Canada and the US (77.7% vs 77.3%), which amounts to 26,224,900 Internet users, about 1/2 the size of the UK. However, according to a recent eMarketer report Canada Retail Ecommerce Forecast: Measured Growth Ahead, 52.7% of Canadian Internet users are online buyers, ~13 million. Canadians spent $16.5 billion online in 2010, and are expected to shell out $30.9 billion in 2015. Nearly every category grew except books, magazines and online newspapers; computer hardware, and automotive products. Most growth occurred in “other entertainment products,” which I assume to be online ticketing (movies, sports and concerts) and potentially online gaming (which may also fall under software or games). Missing from this data are mobile applications and services, electronic books, and group buying activity like Groupon and Living Social deals. eMarketer mentions that Canada ranked 7th worldwide in number of unique visitors to Groupon in October of last year (ComScore). Is Canada an attractive market for international expansion for your online business? When deciding to localize for a particular market, many factors should be considered. In terms of market size (Internet users), Canada is about 1/3 the size of Japan, and is smaller than Germany, Korea, France, Spain and Italy. Make sure you’ve researched the market size for your industry. Consider the popularity of individual categories )e.g. if you sell sports equipment, take 10% of 13 million). 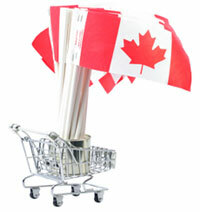 Know your competitors, both domestic and international, and consider your current Canadian customer base. Do they typically have higher average order values? Do they have strong repurchase rates? Do they buy more from certain categories, or only during certain times of the year? Also consider your industry. Canadians are a bit more averse to buying items sight-unseen than their US counterparts. This may be because Canada was never a strong catalog country – though this is a moot point with the Digital Millennial generation. It could also be that Canadians are just jaded by their lack of choice online domestically, and the additional shipping times, shipping fees and “surprise” duties and taxes that put them off. Industries that overcome these hurdles (think digital goods with no shipping cost or delivery time), and items that don’t need to be inspected before purchase (travel, entertainment products, music, DVDs) have a better outlook. Finally, explore ways to internationalize your site without creating a separate domain. IP geolocation and localized content (currency, language, delivery info etc) may suffice without the massive undertaking of a Canada-only site. What if you already operate a localized site in Canada? Make sure your Canadian domain is geotargeted in webmaster tools. And segment your email list with relevant messaging. Don’t send email with special free shipping offers if they don’t extend to Canadians. Don’t send Thanksgiving themed emails in November, or President’s Day deals. Exclude products that cannot be shipped to Canada due to manufacturer or logistical regulations, etc. Looking for help with your ecommerce strategy and site optimization? The Elastic Path research and consulting division is available to enterprises selling digital goods and services. For more inforamtion, visit us at http://elasticpath.com/ecommerce-consulting or contact us at consulting@elasticpath.com.